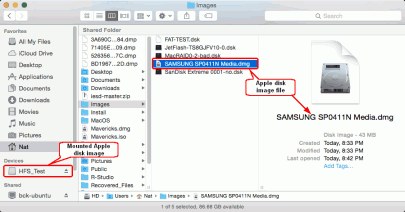 Apple Disk Images are files (usually with the .DMG extension) which the Mac OS X operating system uses to store disk images, with optional data compression and encryption. Such images can be mounted as volumes to access stored data directly from the operating system. Apple disk images are mostly used for software distribution over the Internet, but Mac OS X users can create images of their own disks. And sometimes data recovery from such images is required. This brief article explains how to use R-Studio for this task. Note: We assume that the Apple disk images themselves are good and mountable, only data in the imaged disks may be corrupted or lost. 1. Double-click the Apple disk image file to mount it. 2. 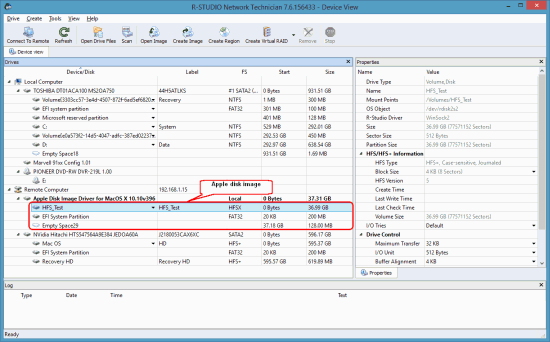 Locate the mounted Apple disk image in R-Studio. You may work with this image as it was a real disk. Although there are several programs that can transfer files from Apple disk images to Windows and Linux systems, they cannot provide access to them at the level necessary to recover data. So we need to use a Mac computer to mount the images and then use network data recovery to allow R-Studio for Windows or Linux work with the mounted images. 1. On the Mac computer, double-click the Apple disk image file to mount it. 2. Run R-Studio Agent for Mac. See R-Studio on-line help: R-Studio Agent for Mac for details. 3. Connect R-Studio to the Mac computer. 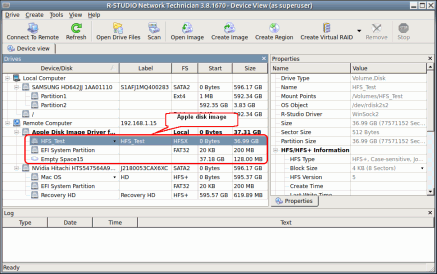 See R-Studio on-line help: Data Recovery over Network for details. 4. 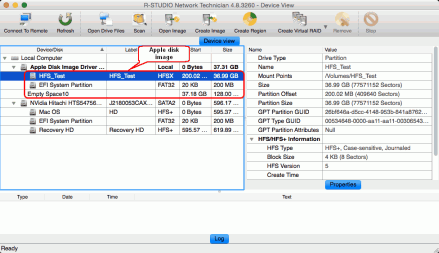 Locate the mounted Apple disk image in R-Studio.